Pepe’s slow-smoked pork shoulder served with thin-sliced sweet red onions and black olives then smothered with our Whistling-Wixy BBQ Sauce… Sweet and Spicy! A delightful chipotle sensation with Mellow or Fire Chipotle Sauce and Pepe’s cheese blend. Top it with baked chicken then fresh sliced mushrooms, sweet red onions, tender nopalitos (cactus), fresh cilantro, & a squeeze of lime. Round ‘em up! The Love begins… Garlic white sauce, roasted chicken breast, mushrooms, tomatoes, scallions, and a little kiss of parmesan and garlic blended. Our special Red Sauce #3, mozzarella, oven-roasted ham OR baked chicken, pineapple, mushrooms, fresh diced sweet red onions, & a pinch of aged parmesan. Finalized with a kiss of Aloha Sauce. Creamy garlic Sea-Czar sauce, mozzarella, ham, artichoke hearts, sliced mushrooms, fresh roma tomatoes, mozzarella & aged parmesan. Fresh sliced roma tomatoes baked on the pizza, fresh basil leaves, Just a little bit of pepperoni, mozzarella and your choice of V.O.O. or Pepe’s Special Red Sauce #3. Sweet chili sauce, fresh peppers on hand, red onions, “nopalitos”, fresh cut cilantro and a squeeze of lime. This pizza is a perfect balancing act of sweet and hot! Senor Pepe’s version of the Street Taco is over the top! Served with Ham – Smoked Pork – OR – Chicken, then topped with fresh taco goodness reminiscent of summer flavors. Cayenne pepper sauce, a very nice flavor recollection of wings called buffalo. Lightly blue-cheesed & topped with Pepe’s oven baked chicken, diced black olives, crushed fresh garlic & a little onion and cilantro. Not sure how it flies? IT ROCKS! All salads made to order. 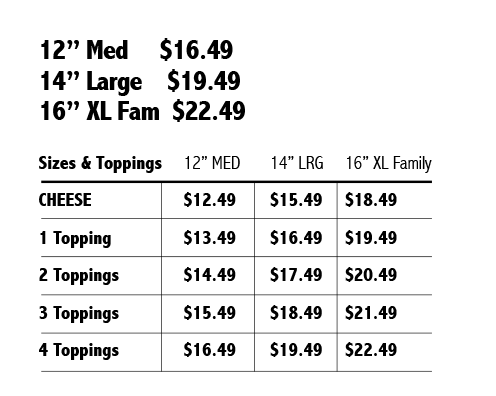 Pick your toppings, pick your size.